battle. of. the. t-shirts. - bitte.und.danke. And here's how I styled my white v-neck tee from Everlane. I kept things casual with a brocade mini skirt from Club Monaco and d'Orsay flats from J.Crew. If there’s one capsule wardrobe essential that every fashion girl should be equipped with, it’s a trusty white t-shirt (or three). Though maybe not the most exciting piece to go shopping for, the styling potential of this basic layering staple shall not go unnoticed. With my favorite James Perse pocket tee seeing better days, my mission to snag a replacement tee seemed more imminent than ever. And so began my search for the quintessential white tee. Since I didn’t want to spend a fortune on another James Perse t-shirt (I snagged my previous one from Marshalls on major clearance), I decided to shop around for a more budget-friendly option. I ended up investing in a v-neck tee from Everlane and an oversized pocket tee from Topshop (purchased through Nordstrom). Read on to see if they’ve lived up to my expectations thus far. Everlane The Cotton V ($15): My very first order from Everlane (more on that in a future post) included a simple white cotton t-shirt. Despite just receiving it a few weeks ago, I’ve already managed to wear it on a few occasions. To date, my favorite way to style it has been with a mini skirt and flats — give or take a field jacket if the temps are nippy. As suggested in the description, I ended up sizing up for a more relaxed look. It’s not too sheer, not too fitted, but just right for a casual half-tuck. The v-neck isn’t too low-cut — it definitely has more of a borrowed-from-the-boys feel. All end all, I would highly recommend ordering one of Everlane’s cotton v-neck tees (they’re available in a slew of colors!) for everyday wear. Pssst: You can receive free shipping on your first order within 24 hours of signup! 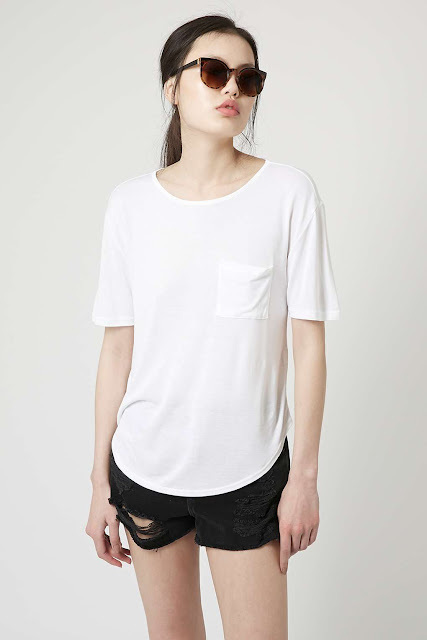 Topshop Pocket Tee ($25): TBH, I was so pleased with my Everlane tee that I could’ve ended my search there. However… while browsing the Topshop section at Nordstrom, I stumbled upon their white pocket tee on sale (marked down to $12), and I couldn’t not invest in it as a backup. Compared to the Everlane tee I purchased, this one flaunts a more laid-back chic fit (I sized up again). It's made of a soft jersey material that’s super comfortable and flattering. And, of course, the pocket is my favorite part! Though I haven’t gotten a chance to wear it, I can’t wait to style it with skinny jeans and a cardigan or knotted with a skirt for a dialed down look. Unfortunately, it seems to have already sold out online — definitely check in store though as it could still be available. The verdict: I found not one, but TWO high-quality white tees that will serve different purposes in my wardrobe. Mission accomplished. What’s your favorite way to style a white t-shirt? Let me know in the comments below! back. to. school. with. bluesky's. day. designer.